In a modest way, I collect N-to-V conversions in English morphology, via zero derivation, -ize/-ise, -ify, and -ic-ate (brief discussion here). (My colleague Beth Levin has a much larger and better organized collection.) Some of these are long-established, and not particularly transparent semantically, but all of the patterns can be used to innovate verbs — and often incur peevish displeasure when they are. Why innovate? Why, in particular, should Language Loggers — well, me and Mark Liberman — have reached for thesaurisize (my preferred spelling) or thesaurusize (Mark's) on occasion over the years? I promised in an earlier post to report on some of the many interesting presentations here at InterSpeech 2010. But various other obligations and opportunities have cut into my blogging time, and so for now, I'll just point you to the slides for my own presentation here: Jiahong Yuan and Mark Liberman, "F0 Declination in English and Mandarin Broadcast News Speech". I still hope to blog about some of the other interesting things I've learned here, but it's already time for me to head out on the next leg of my journey. Worse, I've already got a list of things to blog about from the next conference where I'm co-author on a presentation, EMNLP 2010 — which hasn't even started yet. At the top of that list is Dmitriy Genzel, Jakob Uszkoreit and Franz Och, "'Poetic' Statistical Machine Translation: Rhyme and Meter". The point you make is indeed true, however the example of lie and lay is a curious one. In Australia, the word lie not only survives, but has not become confused with lay in the slightest. The two retain their distinct meanings more or less unabated, forming a sharp contrast to the developments in the US. I would imagine the same would be true of most other English-speaking countries and those learning English as a second language outside the US. When will people learn that nowadays everyone can fact-check linguistic claims of this sort? Kagami-biraki (or kagami-wari) means "opening (or cracking) the mirror" where the "mirror" refers physically to the lid of the sake barrel and symbolically to circular mirrors depicting the sun and used as divine instruments in Japanese shinto religion. The kagami-biraki ceremony is performed at auspicious events, particularly at semi-formal and informal festivities commemorating beginnings. 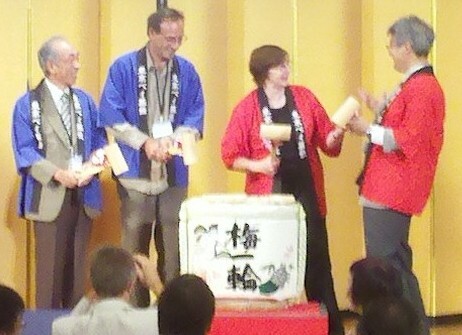 Participants often show camaraderie by wearing informal uniforms (happi shirts are common) instead of formal kimono. I'm very sorry that fax machine can’t receive your fax because of mishandled by pen pusher. My goodness! How does he know such a colloquial expression as "pen pusher"? When I asked that question of some friends, Brendan O'Kane wrote back: "Online dictionaries are responsible for the occasional hypercolloquialism — http://www.nciku.com/search/en/detail/pen+pusher/1300456 . What I want to know is whether an analogous Chinese-Spanish dictionary will give 'cagatintas'." Apparently "ain't", "like" and "innit" make you sound stupid, and we need to reinvest in the idea of, um, as it were, articulacy, as a form of human freedom and power. Well, at least Pflaumbaum warned us that it was off topic. Anyway, go ahead and follow the link to read the story about Emma Thompson. It's very, very short. I'll be here waiting, below the fold. Of the 23 recipients of the 2010 MacArthur Fellowships (the so-called "genius grants"), two are linguists: Jessie Little Doe Baird, program director of the Wôpanâak Language Reclamation Project, and Carol Padden, a professor in the Communications Department at the University of California San Diego who specializes in sign languages. Congratulations to them both! Descriptions of their work from the MacArthur Foundation after the jump. Checking on Aleut: kudos to the Times! The night Lisa Murkowski announced she would mount a write-in campaign to retain her Senate seat, she acknowledged to a crowd of supporters that her odds were slim. Then she prompted a defiant roar: invoking Native Alaskan culture, she told the crowd that the ancient Aleut language contained no word for "impossible." It was a deft play to the state's strong sense of identity and a direct appeal to native communities, whose support could prove crucial. It was also inaccurate. The word in Aleut is haangina-lix. "It's very clear that you can say ‘impossible,‘ " said Gary Holton, the director of the Alaska Native Language Archive. "Clearly, she wasn't checking her facts." Fact checking! On a point about language! Kudos to the the New York Times. Champagne will be served in the Senior Writers' Lounge at One Language Log Plaza at 5 this afternoon to celebrate this unusual and praiseworthy sign of interest in linguistic accuracy in the journalistic profession. We are most encouraged, and we salute William Yardley, the reporter who wrote the story. From the pages of Xin Tang, Mark Swofford has resurrected a classic piece by John DeFrancis entitled "Homographobia." Here's Mark's post. The entire essay may be found here. A pdf of the whole issue of Xin Tang 6, in which John's essay appears, is available here. Homographobia is a disorder characterized by an irrational fear of ambiguity when individual lexical items which are now distinguished graphically lose their distinctive features and become identical if written phonemically. The seriousness of the disorder appears to be in direct proportion to the increase in number of items with identical spelling that phonemic rendering might bring about. The aberration may not exist at all among people favored by writing systems that are already closely phonemic, such as Spanish and German. It exists to a mild degree among readers of a poorly phonemic (actually morphophonemic) writing system such as English, some of whom suffer anxiety reactions at the thought of the confusion that might arise if, for example, rain, rein, and reign were all written as rane. It exists in its most virulent form among those exposed to Chinese characters, which, among all the writing systems ever created, are unique in their ability to convey meaning under extreme conditions of isolation. Yet Another Self-Referential Rhetorical Critique: Martin Robbins, "This is a news website article about a scientific paper", The Guardian, 9/27/2010. Said the Pirate King, "Aaarrrf …"
There's actually some serious historical linguistics (and cultural history) involved here, as discussed in "R!? ", 9/19/2005, and "Pirate R as in I-R-ELAND", 9/20/2006. And even a bit of mathematical linguistics. This year I have a reason for returning to the pirate ship (though I'm a bit late in getting around to it): the delightful children's book Seadogs: An Epic Ocean Operetta ("composed by Lisa Wheeler, staged by Mark Siegel" and published in 2004 in hardback, in 2006 by Aladdin Paperbacks), which is at the moment my grand-daughter Opal's very favorite book in the whole world. Probably one of the very worst things about the English writing system (and it has a huge long list of bad things about it) is that it very clearly employs 27 letters in the spelling of words but there is a huge and long-standing conspiracy to market it as having only 26. Insane, but that's what English has done.